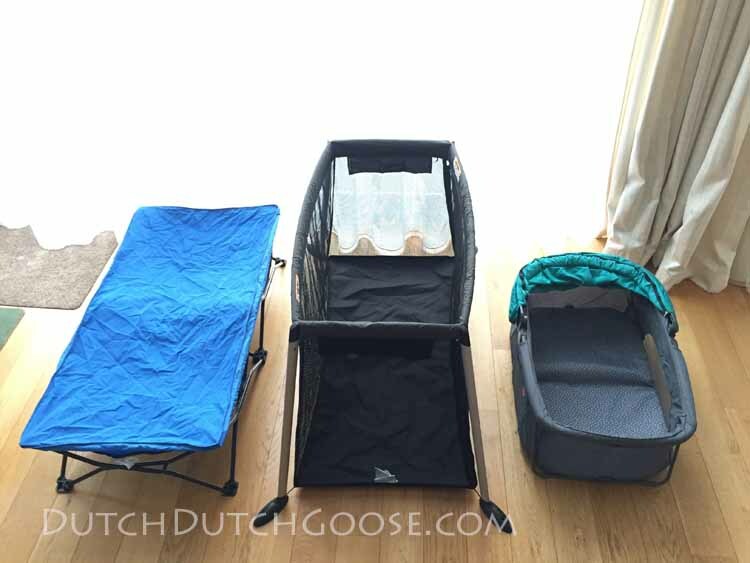 With three little ones to squeeze into a sleeping space we are always on the lookout for travel beds. We’ve told you about our Diono Bassinet and Phil & Ted’s Travel Crib, which are our picks for our little little and middle little. The big little was a bit harder to find something for, mostly because he is quite opinionated. Good News! He has been loving his Regalo Travel Bed. We love that it folds up quite small. Although we haven’t taken it on a trip by plane yet, we’ve easily packed it for several car trips. He loves that he gets his own space to sleep. We have found that it needs a bit of extra padding. Several moms who use this bed told me they use an inflatable camping mattress with it. We’ve requested an extra blanket from hotels and used that to pad the bed, and H has slept quite comfortably. It packs pretty easily into its own carrying bag, which is a plus. Even H can set up the bed. It gives him something to do while we are setting up our hotel room. The fabric is durable, the legs are strong and the folding mechanisms look like they’ll last. Here is what one of our typical hotel rooms looks like. On this trip we had our middle little (2) in the bed with us, since this is where he had been preferring to sleep anyway. The little little is not pictured, but he is on a bassinet on the other side of the bed. Our big little likes to move his bed into a “trip dad when he goes to the bathroom” position, but he loves having his own place to sleep. Hotels in Europe often charge for the use of a roll-away cot if they have one to offer at all. We’ve found coming with our own sleeping options for the kids keeps our cost down and makes sure that everyone has a comfy place to sleep. This post contains affiliate links, but as always the opinions are our own.